Archadeck of Columbus explores the growing popularity of hardscape designs used to enhance the front of the home. This paver sidewalk and landing is carved out into the landscape and adds loads of curb appeal to this Columbus, OH home. 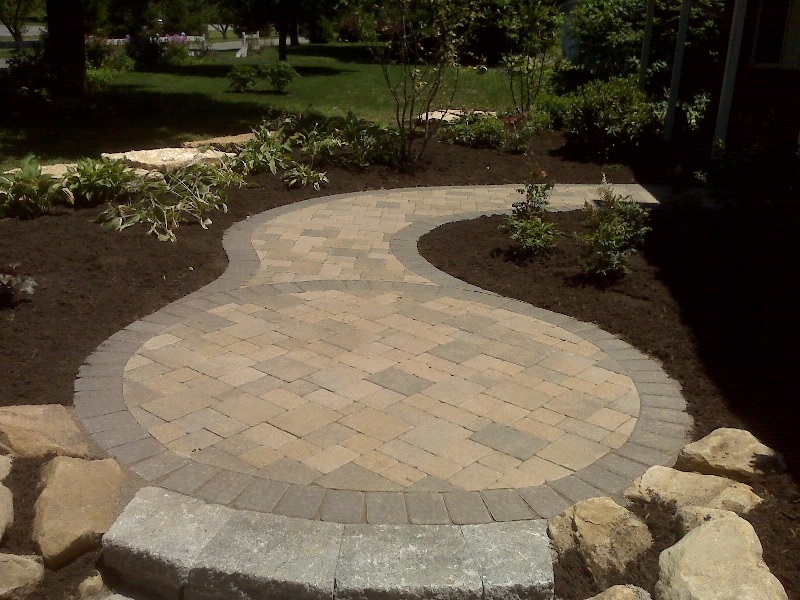 When you mention the term hardscape, most people automatically envision a backyard paver or stone patio. Backyard patios are a huge asset to your outdoor living space but the realm of hardscape designs is vast and hardscape designs are not confined to the backyard. There is a plethora of design options in adding a hardscape space to either the side or front of your home. 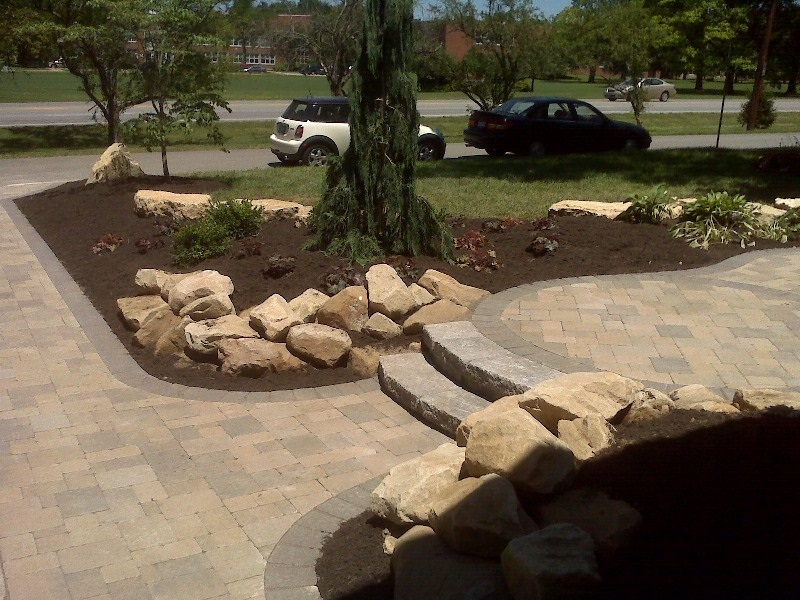 Hardscapes can change the entire mood and look of your home and the surrounding landscape. You can peruse through the pages of any upscale home or outdoor living magazine sitting on the store shelf and see the trend in pavers and stone as they move from the backyard and into areas that are more visible. Any realtor will be quick to point out that adding curb appeal will increase your return on investment on outdoor additions. Homes with great entrances sell quicker and will put more money in your pocket at closing. 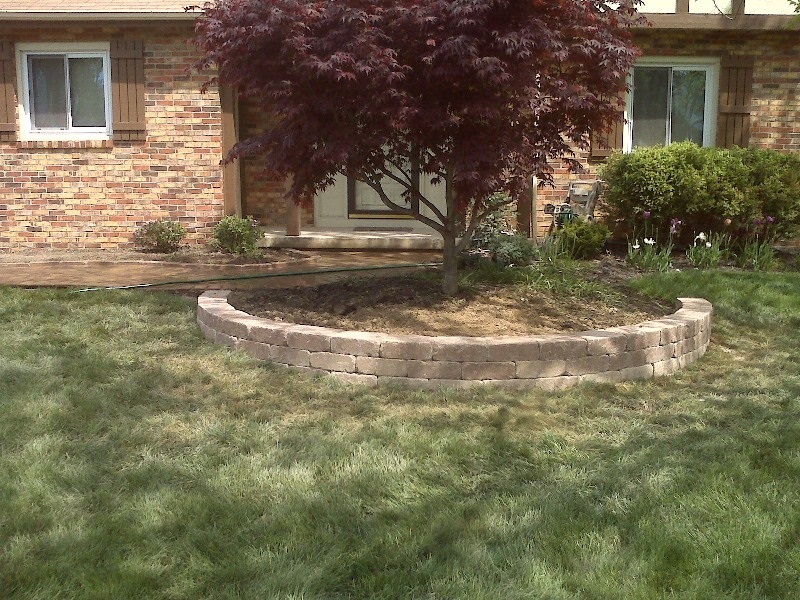 Another view of this lovely hardscape addition in Columbus, OH. You can really beautify the front of your home and add curb appeal by adding a paver walkway or sidewalk. Even a concrete driveway takes center stage when transformed into a hardscape or paver driveway, this will also give your entire property a more upscale and refined look. Archadeck of Columbus has also had great success in upgrading the aesthetics of the home by adding hardscape curved stairs, retaining walls, planters and even landings. Most walkways, driveways and landings are built in just concrete, but in the past few years we are seeing that trend shifting towards constructing these areas in hardscapes. There is a multitude of products offering different colors, textures and patterns that genuinely blend with the colors of your home, whereas concrete is just concrete and really doesn’t “match” anything. This hardscape addition in Columbus, OH features a paver driveway and sidewalks. Materials like stone and pavers not only harmonize better with the colors used in many brick, stucco and wood home facades; they can also soften the lines of your home. Most homes are very linear in nature, for example you may have a rectangular or square entry or landing with square steps to access these areas. Removing these linear areas is simple in most cases, and they can be replaced with curved pavers or vertical dimensions including stairs to beautify the front yard. When using pavers in a design, you gain the ability to curve areas that will contrast and compliment the linear and square dimensions of your home adding visual interest. 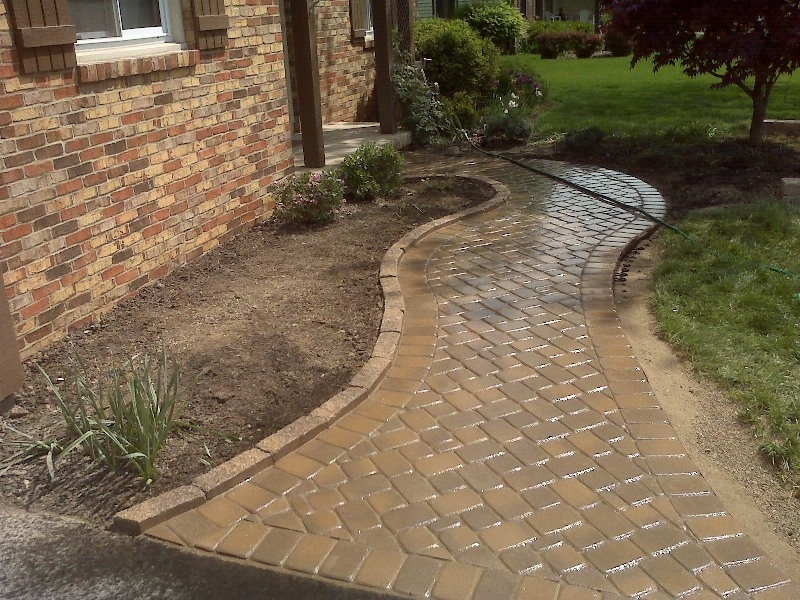 The beautiful curves of this paver sidewalk soften the brick facade of the home. One of the most favorable trends in hardscapes right now is the front courtyard. The front courtyard can totally change your perspective of the front entrance to your home. The concept behind the front courtyard mimics the front porches of old providing a cozy area where you can sit down, relax and reconnect with your neighbors. These spaces even make the perfect place to wait for your child to arrive home from school because it gives you a vantage point to see them get off the school bus in the afternoon without having to stand at the curb. A front courtyard will also provide seasonal space for you to enjoy throughout the outdoor living season and can even be designed to include amenities like seating walls and end pillars which can be used to mount versatile lanterns to light the space. Adding hardscape planters is a practical way to add appeal to the front of your home. As with any outdoor addition the front of your home should set the stage for the design, textures and colors you choose for your hardscape addition. You may also consider replicating, augmenting or complimenting specific architectural features of your home to gain the most success from your anticipated hardscape design. The key to a successful hardscape addition also lies in keeping the scale and proportion of your design in mind. 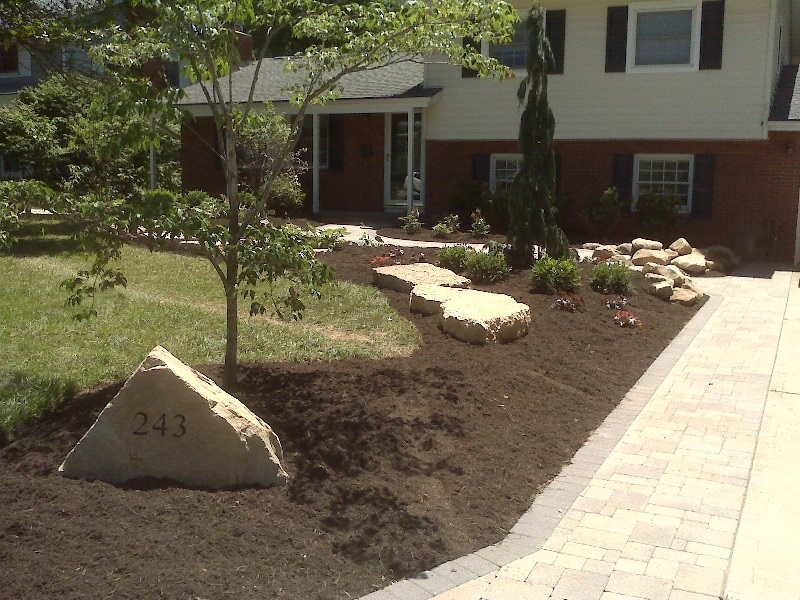 Even a simple hardscape addition can make the front of your home more unique, because the key to a wonderful hardscape design is to keep it safe and practical.